Qualcomm just announced yesterday the details surrounding its Snapdragon S4 System on Chip, promising an impressive array of improvements over their current-gen line. To begin with, the Snapdragon S4 shifts away from previous 45nm constructions and boasts a trim 28nm process technology, which will improve power consumption and thermal performance, as well as free up more space by using smaller components. 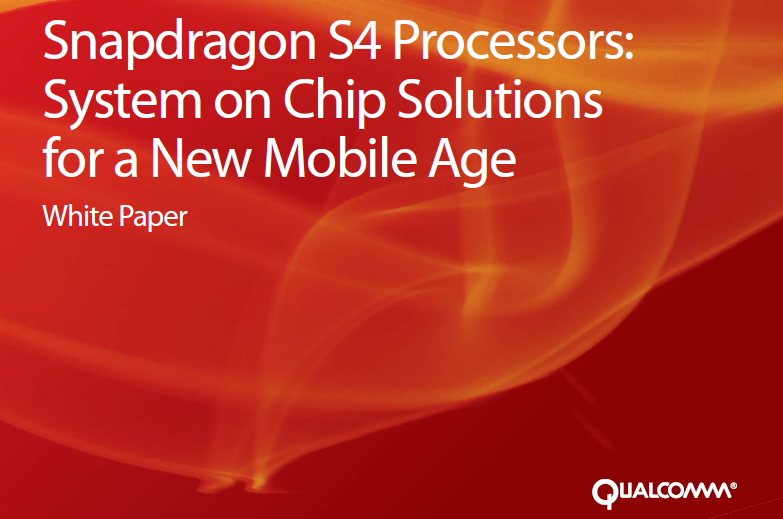 In the CPU department, the S4 CPU, codenamed Krait, will top at 60% better performance over Qualcomm's current Scorpion line, reaching speeds from 1.5 to 2.5GHz, while utilizing asynchronous multiprocessing and dual-channel memory. The Adreno 225 GPU will top the 220 by about 50%, adding DirectX9.3, OpenGL ES 1.1 and 2.0 capabilities for Windows 8. Finally, Qualcomm says that the MSM8960 aboard the S4 will have multi-mode world capabilities, supporting frequencies from 700 to 2600MHz, LTE, HSPA+, EV-DO Rev. B, 1x Advanced, TD-SCDMA, GSM, GPRS, and EDGE. Not to mention its NFC support, and the usual fare of Wi-Fi, Bluetooth, GPS, and FM Radio. This chip sounds like something to look forward to, and it will no doubt be interesting to see the s4 in action in 2012. [Weekend Poll] Are You Waiting For The Galaxy Nexus/Nexus Prime To Upgrade Your Phone?